If you’re a deal savvy traveler you’re likely always on the hunt for the best price when booking hotels and you’re well aware of the high competition of booking sites. Many hotel programs offer a best rate guarantee that gives you a discount or even a free night if you find a lower advertised price on a third party booking site. Hotel programs offer this because they want you to book directly through their website as it saves paying a commission to a third party booking site. It also often makes it more difficult to find a lower price than booking directly. How to Find a Lower Price? This is where membership hotel booking websites come into play. If you read the fine print of most, if not all, best rate guarantee programs will exclude membership websites. This is because it is possible for membership websites to often offer lower prices. Now you’re probably thinking…how do these websites make money if they are selling hotel nights for less than the hotel. They make it up through their membership fees. The savings may only be some 2-3% so if you don’t book a high volume of hotel nights per year the membership fees may not make sense. However if you can get that membership fee waived the first year, then you have nothing to lose. This is exactly what a new membership website called Club1Hotels is doing. They are offering a free 1 year membership trail on its new beta program. But first, let’s first take a look to see if the program has anything to offer. With a Club1Hotels membership you get access to special hotel prices through there website. Clearly the main benefit is just getting access to booking cheaper “wholesale” hotel rates. 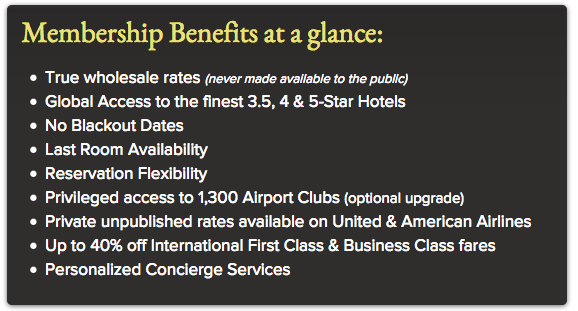 Note that the trial membership does not come with the Priority club or airfare discounts. After signing up to try the free membership trial I wanted to see how their prices stacked up. Before I went and compared a bunch of randomly highly sought after, high-priced hotels I thought the best unbiased way to compare their prices would be to compare prices at the last several hotels I have stayed at this year. The results show that there are savings to be had, but not with every hotel and every date. The takeaway is that Club1Hotels could be a great place to double check that you’re getting the lowest price. After all spending another search that could save you $100+ it’s worth it! 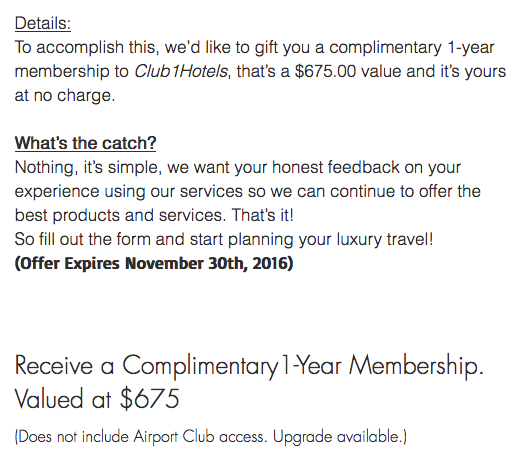 I’m always for giveaways and this time around I have a $100 Club1Hotel voucher to give away to a blog reader. Sign-up for Club1Hotels free 1 year trial membership. Leave a comment below with a destination you would love to use the $100 stay credit at. Giveaway details: The deadline to enter is Thursday, October 6 at 5:00 PM EST. You must be registered for the free membership in order to win. A winner will be randomly picked from the entries using random.org and notified via email. Once the winner is notified they have 3 days to reply in order to claim their prize, if they do not reply within the time period the prize will be forfeit and a redrawing will take place. Club1Hotels is solely responsible for providing prize to winner. I’d love to spend a weekend at the Ritz-Carlton in Los Angeles! Fairmont, Bermuda! My favorite island destination.